Philadelphia is turning inside out. It used to be a commercial, financial and business center, surrounded by beautiful suburbs. It is now turning into a marvelous urban residential area, surrounded by a ring of commerce based on the ring of interstate highways. Commuters leaving the city in the morning outnumber the commuters coming in, and traffic jams are worse in the outer ring. More precisely, the metropolitan area is a series of concentric rings. 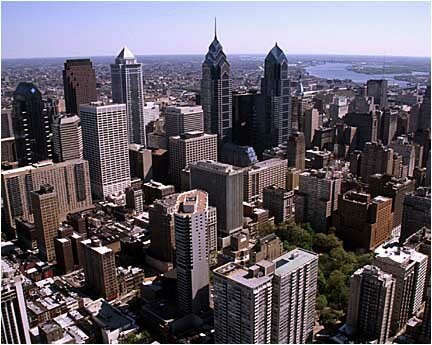 The bull's eye is Center City, with urban residences, culture, entertainment. Immediately surrounding the bullseye is a ring of decaying industrial slum. Surrounding that are the suburbs, and beyond them are the new malls and industrial parks. Further out is exurbia, where Philadelphia's "equestrian class" is mixed with what is left of the farmlands, rapidly being invaded by McMansions intended for employees of the commercial ring. Some people live their whole lives in just one ring. Somewhere near Washington's old encampment at Valley Forge there is an invisible line. The people who live inside that line, live in Philadelphia. But just one house further out, on the other side of the invisible line, the orientation is toward central Pennsylvania. The people outside the ring mean "Pottstown" when they say they are going to town; if they say they are going to The City they mean "Reading". Going to Philadelphia is for them like going to Paris; they did it once. There are other invisible lines. At the edge of the central city bullseye, there is gentrification; yuppie families are renovating the 19th Century mansions their grandparents abandoned for the suburbs, displacing working-class families who lived for a generation or two in decaying grandeur. The local bars are inhabited by one class, the neighboring restaurants are where the newcomers hang out. Beer in one, wine in the other, and sour looks when members of the wrong class blunder in. In London, you see the same thing, except it is usually a single building with two entrances. There is another border region out further, where upwardly mobile minority groups are pushing out toward the suburbs. Curiously, working-class Philadelphia always tended to live in "neighborhoods", and their out-migration has more commonly leap-frogged to "Jersey", their places being increasingly taken by Asian immigrants.